Vicar: Do you have a stock portfolio perhaps? Vicar: I don't know, I just thought you might have one. In the past three years there has been a new kind of British Invasion. Forget music, or even clothing—this time it is in the form of movies. After The Full Monty became the sleeper hit of 1997, more and more studios started importing films from Britain and more and more films started making money. From Waking Ned Devine to Lock, Stock, and Two Smoking Barrels, the resurgence of the British film industry has been very profitable for American distributors. 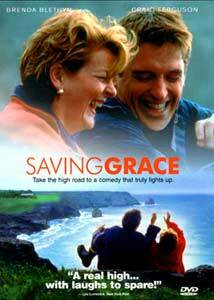 And while Saving Grace is nowhere near the level of Barrels or Devine, it is still an above average movie. When Grace (Blethyn) inherits a large debt from her late husband she faces eviction from her home. Searching for a way to pay back the nearly 300,000 pounds she owes, she decides to put her gardening skills to work. With the help of Matthew (Ferguson), she decides to grow a large crop of marijuana that will surely yield enough money to pay back the debt. But when Grace must travel to London to find a dealer, things get more complicated than they are already. There are moments that work in Saving Grace, but unfortunately there are just as many that don't. The film never really decides if it wants to be a comedy or a drama about moving on after the death of a loved one. Ultimately the film bounces from comedic moments to dramatic moments way too often. I eventually found myself wanting it to just pick an emotion and stay with it. First time feature director Nigel Cole handles the film well enough, even if he lets the situations of the third act get a bit out of hand. Grace's fish out of water situation plays well due largely because of Cole's accomplished comic timing. Plus, how many directors can make the viewer root for a fifty-something drug dealer? Not many that I can think of. Two time Oscar® nominee Brenda Blethyn plays Grace so well, that she makes the movie worth watching just for her performance. Craig Ferguson, (The Drew Carey Show</b>) steals the movie as Matthew, the pot smoking right hand man of Grace's. And much like most recent British imports, a colorful cast of supporting characters is also on hand to provide some laughs. Image Transfer Review: Like most New Line transfers the 2.35:1 anamorphic transfer for Saving Grace is of the highest (no pun intended) quality. The blues that dominate the early chapters are done well, as are the more vibrant colors later in the film. Sharpness and detail are done well, and black levels are deep and nicely done. A full frame transfer is also offered although I am puzzled as to why anyone would watch it. Audio Transfer Review: Graced (again, no pun intended) with a Dolby Digital 5.1 mix, Saving Grace offers a bit better mix that most comedies. Thunder, explosions, and the films score fill the surrounds on more than one occasion. And the heavy British dialogue is clear and easy to understand throughout the film. The .1 LFE channel gets some activity, and when called upon gives nice clean and tight bass. An English 2.0 mix is also offered. Extras Review: A commentary track by director Nigel Cole, actor Craig Ferguson and co-screenwriter Mark Crowdy is the best extra you will find in the special features section of this disc. This track pays attention to how the film was made and offers some nice anecdotes on the behind-the-scenes action. Another track featuring Brenda Blethyn, Ferguson, and Cole is worth a listen, but sadly sounds as though it was edited together from different interviews. This track focuses more on the characters and British culture than behind-the-scenes stories. The theatrical trailer is presented 1.85:1 with a nice 5.1 soundtrack. Cast and crew bios round out the extra features. Whether you like Saving Grace or dislike it will depend greatly on your sense of humor. If you are the type looking for a film about pot that fits the same bill as Half Baked or any Cheech and Chong movie, you will be looking in the wrong place. But if you like lighthearted comedies, you might find a winner. I am stuck in the middle, part of me really liked the film and found it funny, but the other half found it a bit dull and uninspired.